Guest Blog by: Bryan Jones, author of the Assets eLearning Blog and President of eLearningArt.com, a stock photo site for the eLearning industry. One thing I notice when hosting workshops is that the first time users try to insert character images, the end product looks about the same for all users: they use the character as an avatar and the full character (head to toe) is in the viewable area. It’s not that this is a bad way to use a character; it’s just that it’s only one way to use characters. And that doesn’t leverage a lot of the power that characters provide. I’ve been building character-based eLearning courses for over a decade and I’ve tried to summarize what I’ve learned in this post. 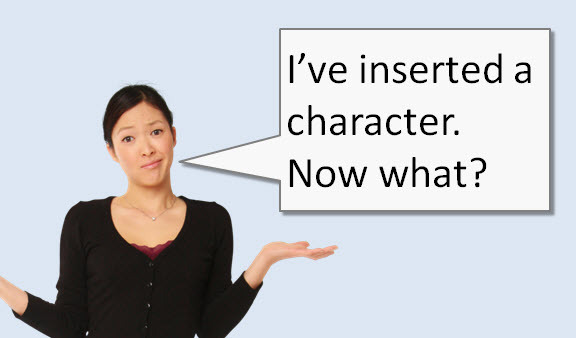 Hopefully this will inspire you to use characters to help your courses come to life. What makes for a “good” character image? If you don’t have CP6 and need some files to experiment with, you can download free sample images here. Over the next several weeks, I’ll provide detailed lessons on the best practices for each of the character techniques listed above. 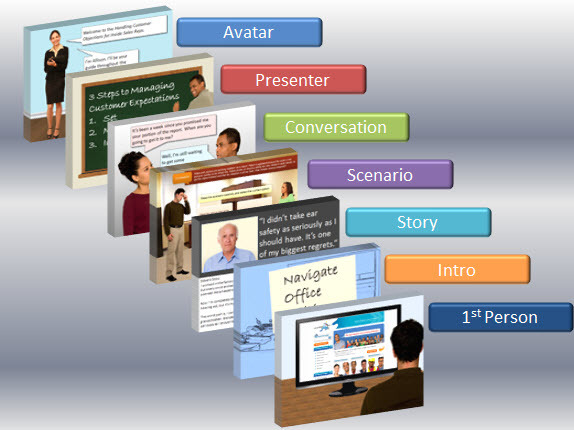 In the next lesson, we’ll teach you how to use avatars to guide your learners through a course. Also, please join me in my session at the Adobe Learning Summit 2012 on October 29. I look forward to seeing you in Vegas! I’m looking for hairdresser avatars for Captivate 8… do they exist? I have Captivate 7 but no characters are listed for selection via Insert > Characters. Are some supposed to come with the software without an additional purchase? If you have the trial version they will not appear. If you decide to purchase the full version then you will need to download the characters from Adobes website. 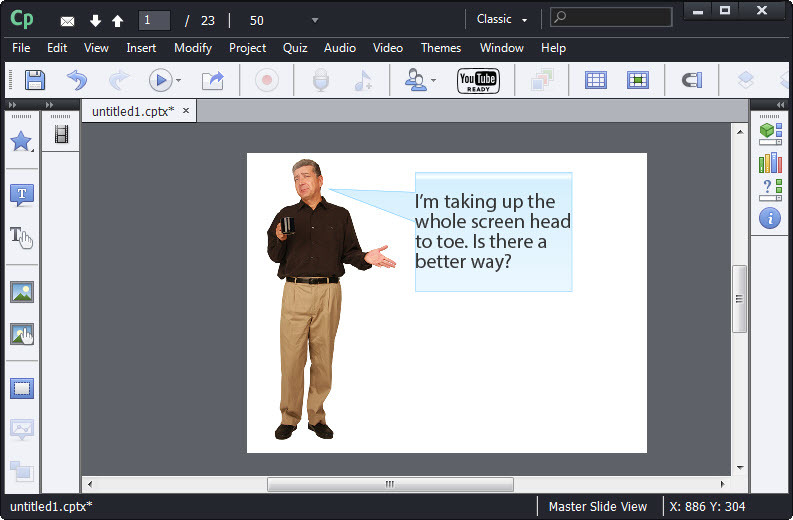 Do Captivate and Presenter both look to the same location for characters? can you create and add custom actors? Fantastic post! Thank you! 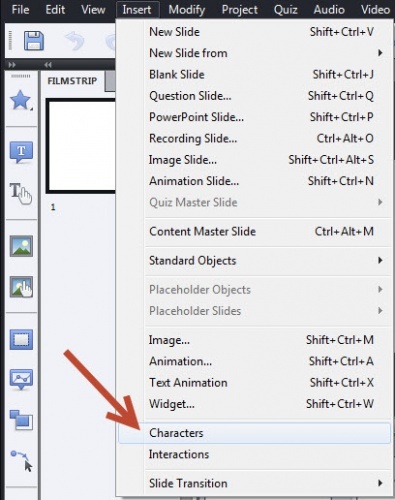 I love characters and I’ve purchased a few of my own, so can you tell me how I can add them to Captivate 6? I also have the free sample ones that I would love to add. Thanks in advance. Thanks Pooja. That’s great and much appreciated.